South Korea’s tax authority has launched a nationwide investigation on overseas tax evasion by individuals and companies, in what would be the biggest of its kind since it started to look into overseas tax dodging practices. The National Tax Service (NTS) said on Tuesday that it is investigating on 65 companies and 28 individuals suspected of dodging taxes overseas. Suspected individuals include many high-income earners such as doctors, professors, fund managers and celebrities, the NTS said. The tax authority selected targets for the investigation by comprehensively analyzing tax dodging reports, foreign exchange, trade, and capital transactions, exchanged documents containing financial information with overseas authorities, and information provided by overseas sources. In particular, the NTS referred to financial information provided by tax havens Cayman Islands and British Virgin Islands. The NTS expected that the latest investigation on offshore tax evasion will be more effective given that it will receive financial information from 98 countries including Switzerland, up from previous 78 countries. Investigation on offshore tax evasion had so far targeted large conglomerates and big asset owners but this time the crackdown has been expanded to include high-income professionals and mid-size conglomerate owners. When it comes to information on criminal charges, the tax authority will launch a joint probe with the government’s special investigation team dedicated to illegal asset redemption overseas. Last year, the NTS found a total 233 cases of offshore tax evasion and collected 1.32 trillion won in taxes, up 490 billion won from 2012. 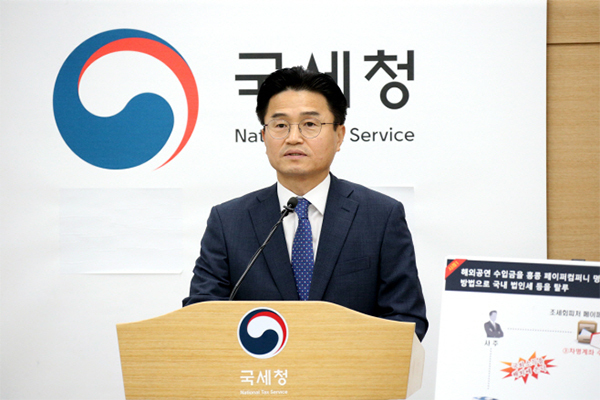 The NTS also collected 540.8 billion won in taxes after launching two investigations since December last year on 76 suspected cases of which 58 have been terminated. The NTS plans to actively seek to fine those entities set up in tax heavens by local residents according to the country’s punishment of tax evaders act if they reject the submission of their tax information of the entities upon request.